The Moment This Mother Realizes Her Baby Has Been Saved From The Fire My Heart Leaps With Joy. Much has been written about the difficult situation of orangutans who are fighting for their existence, while rain forests are destroyed in Indonesia. But when words are not enough, a single image can speak volumes. The orangutans living in Borneo are endangered with only about 55,000 individuals left. Fortunately, there are good-hearted volunteers who do everything to save orangutans. 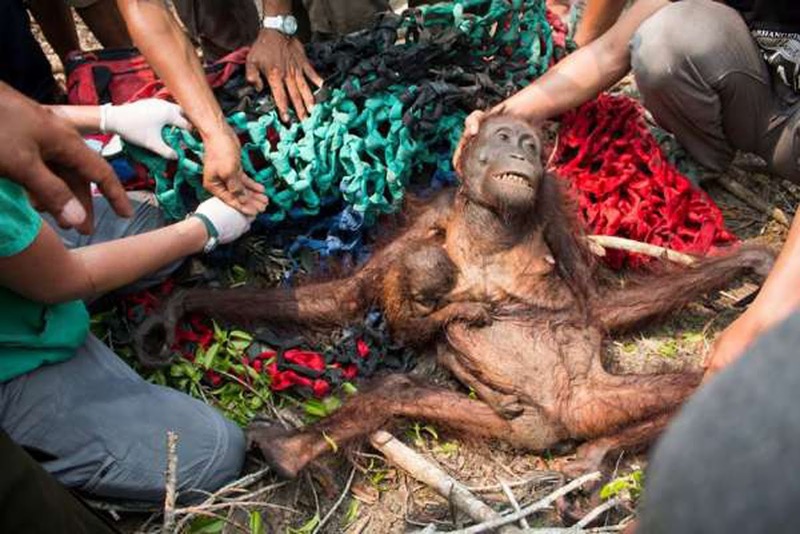 When a large forest fire raged, a group of International Animal Rescue came to the rescue just as a desperate orangutan mother and her baby fought for their lives. “They were forced out of their forest home as a result of the fires and ended up in a village. The villagers were frightened and threw things at the terrified mother before attempting to capture and tie her up. Fortunately our team got to her just in time,” states the International Animal Rescue organization in a Facebook post. A photograph of the rescued orangutan mother and child speaks volumes. The mother’s eyes say everything about how she feels when she senses the touch of a gentle hand. The expression on her face made my heart burst. I’m so glad that she was saved! The mother was quickly given oxygen and recovered after some time. More than a dozen orangutans have been rescued in recent weeks due to fires, which were likely started by ranchers attempting to clear land for farming. This mother and her child were among the lucky ones who made it out alive. The mother and her baby were eventually moved to a safe area of the rainforest that has not yet been exploited. Under the supervision of a conservation team, they are expected to recover from their terrifying experience. Such fighters!